When it comes to creating a fashion model agency website, a design that appeals to your visitors is critical. 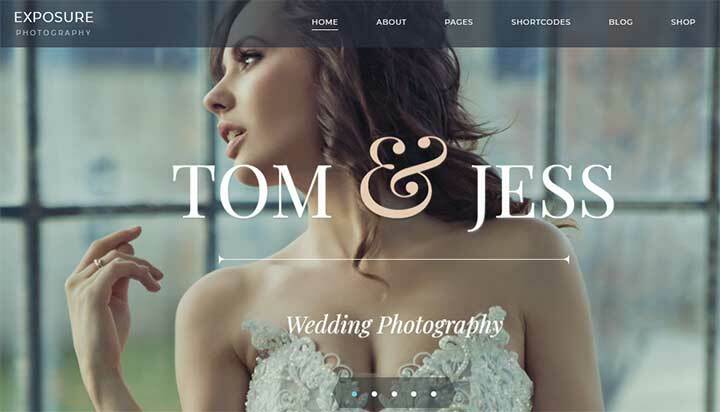 These model portfolio websites mostly focus on elegant design and typography that enhances the overall design of the site. As the fashion industry is related to glamour, models, designers, and portfolios, it becomes important to have a website which has all the above features and gives you the flexibility of customization. Top Model is a fashion model agency WordPress theme which is perfect for building a fashion model portfolio website. This theme provides a wide range of portfolio options so that you can easily introduce your models and your fashion projects. Top Model gives you ready-made home page layouts to choose from or allows you to build your homepage layout. This modelling portfolio template also provides great eight portfolio layout options and four blog layout options to showcase your models with a lot of custom options. You can also schedule your shows and other events with the built-in Events Calendar with this theme. Other features of this theme include Custom Widgets, 99+ Custom Shortcodes, Responsive Layout, Unlimited Menu Colors, Custom Page Backgrounds and more. One of the most powerful and flexible theme for WordPress Ultra Themes by Themify helps you create a beautiful Model Agency website. Ultra Theme has been developed keeping the designers in mind thus making it a must-have theme. Ultra offers a great selection of pre-built demos and designs to choose from. One of its pre-built demos, an agency is elegantly crafted for a model agency WordPress website. This model agency template allows you to import its demo in one minute which includes all the theme settings, menu, content, widgets and more. Thus, saving you a lot of time and technical brainstorming. Ultra Theme comes with 12 Bonus builder add-ons to enhance your functionality, 60+ pre-designed layouts, Full section Scrolling, Mega Menu option to display recent posts and much more. Bridge is a creative multipurpose WordPress theme which allows you to create stunning websites for any type of profession be it a model agency, a portfolio website, a corporate team website or a freelancer website. This theme comes with more than 376 attractive demos which are easy to import and highly customizable. This theme also gives you 24 layout concepts from a standard site layout to the innovative ones. 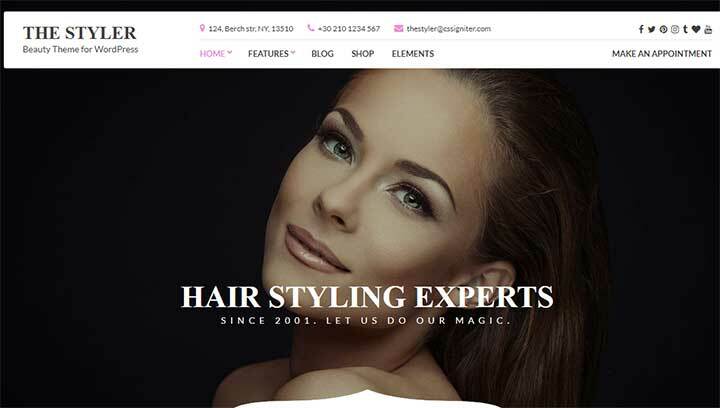 This model agency website template also comes with few plugins which provide functionality such as Full Listing Functionality, Full news functionality, full restaurant functionality, and Front-End Login Functionality. 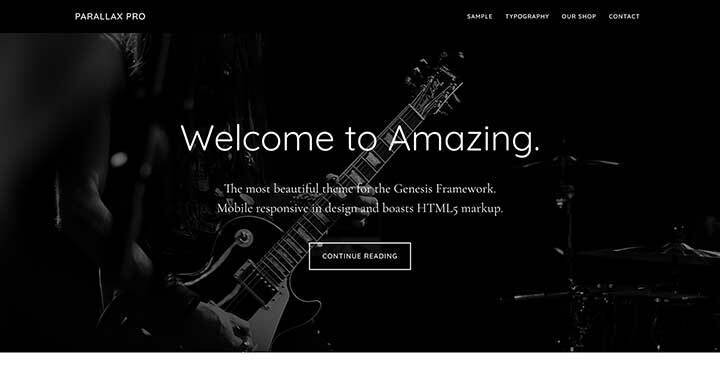 Other features of this theme are Fully Customizable Headers, Fully Customizable Title Area, Fully customizable Mega Menu, Sticky Headers, and many other features to help you create a beautiful website. One of the largest-selling multipurpose themes, BeTheme has a lot to offer when it comes to creating a website for a model agency. They offer 390+ pre-built websites which you can easily import with just one click. BeTheme has its own Muffin Builder 3 which give you the freedom to customize your website just like you want. It comes with 20 customizable header styles, 200+ shortcodes, unlimited menus, parallax effect, and video background and a lot more customization options so that you never fall out of options. One of the best features of this model agency theme is it gives a clean and minimal look to your website. Ronneby is a powerful theme packed with some outstanding features and options which can help you create a stylish model agency website of your own. This model agency WordPress theme gives you 40+ demos specially built for agencies, designers and developers. It is also WooCommerce ready which means now you can quickly sell your services from your website itself and convert it into an easily accessible e-commerce store. Ronneby is translation ready and comes with a powerful and clean admin panel with a lot of shortcodes to customize your website the way you desire. 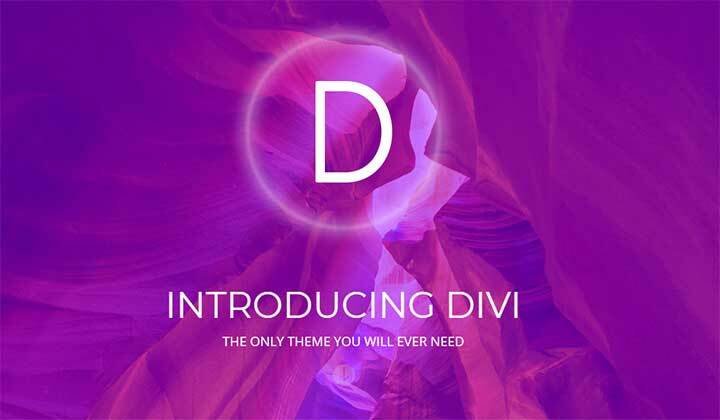 Developed by Elegant Themes, Divi is among the best multipurpose themes of WordPress. Due to its attractive design and a wide range of amazing features, this theme is best suited for a model agency WordPress website. Divi provides its own divi page builder which is a fast and intuitive front-end editor to customize your website just like creating a masterpiece. You can customize every element of your site with 46 different content elements, 20+ pre-made layouts, easy importing and exporting options, etc. Also, the documentation and updates which Divi provides are top-notch. POFO is a creative portfolio theme which lets you create websites such as Portfolio, Creative Agency, or any other type of WordPress website. It gives your site a modern look with 25+ unique demos, various portfolio demos to customize your website swiftly. With the help of WordPress customizer working in the background, you can easily change any element of the theme and see those modifications in real time. Also, the WYSIWYG editor which is a drag and drop editor allows you to create any web element and save it in your library for reuse. This WordPress model agency theme also works well with many plugins such as WooCommerce, Contact Form 7, WPML, W3 total cache and many more. This gorgeous theme by Stephanie Hellwig is excellent for showcasing your photos with zero distractions. 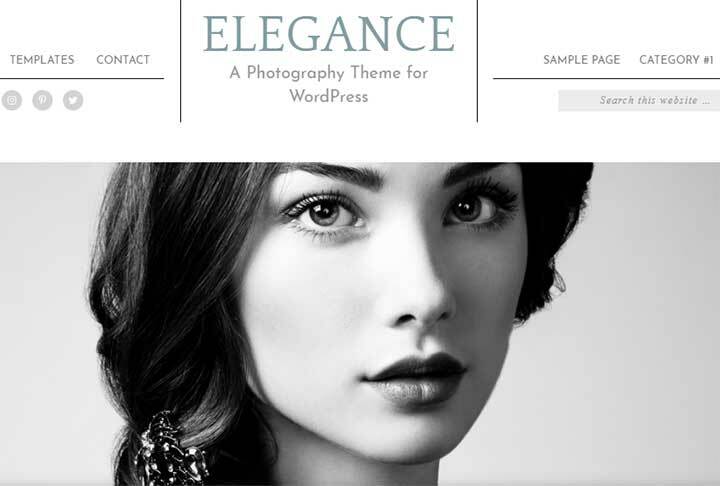 Elegance is a feature-rich and easily customizable theme to help you create a beautiful website. Elegance provides custom built-in page templates to build your site. These page templates include Default archive template, Category Archive, Portfolio. Blog, Proof Gallery, and a styled pricing table. You can easily customize your theme settings, content colors with the help of them customizer. Elegance also includes features such as mobile responsive, customizable header, customizable widget areas, Super-fast page load times and more. Silvia is a theme dedicated to modelling companies & photographers. It is a model agency WordPress theme which allows the photographers to share and promote their via their portfolio online. It is a minimalistic photography theme which gives you a blank canvas to allow your photos to shine and allow your users to see your work without distractions. 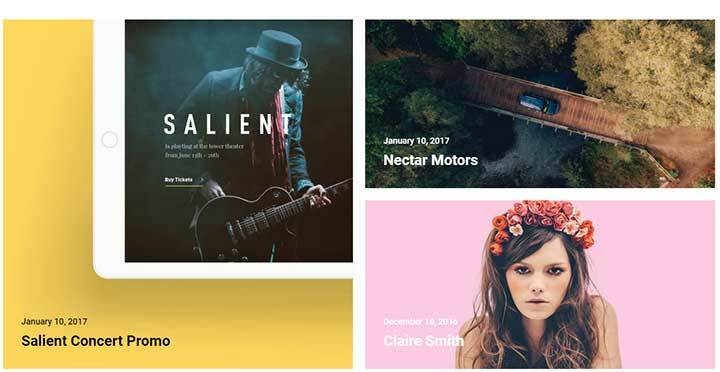 With the help of theme’s photo gallery mode, it becomes easier to publish images on your portfolio in many creative ways. This model agency theme also includes a varied section of layouts such as different content and sidebar configurations, multiple columns and grid layout so that you can present your work in the best manner. Other features of this theme include Regular Updates, One Click demo export, easy customization options, social sharing options, pixel-perfect design and a lot more. One Page theme is a creative single page WordPress theme which can be an amazing theme for your business or profession. This theme features a Drag and Drop homepage layout and blog layouts to help you get started easily. A responsive theme and fully-optimized theme, One page gives you different customization options such as unlimited color schemes, floating menu options, and other theme options which you can use to customize your site the way you want. Other features of this theme include Responsive design, clean coding, fast loading, counter to show your business statistics, portfolio section, testimonial section and a lot more. Talent Hunt is a Model Talent Management Service theme that provides you with many features to create a talent management website or a talent directory website. You can use this theme for conducting auditions, Fashion Models Agencies, Talent Agency, Photography portfolio website, and other such talent procurement websites. This model agency WordPress theme is compatible with the famous PODS plugin which you can use to create custom meta fields of different types. You can also register users and create their profile with the help of Ultimate Member Free Plugin which comes with this theme. The team behind this model agency template has also created an Advanced Search Widget which can be used to create simple and advanced search filters within seconds. This theme also allows you to create pages and to customize them using their easy to use Drag & Drop Page builder. 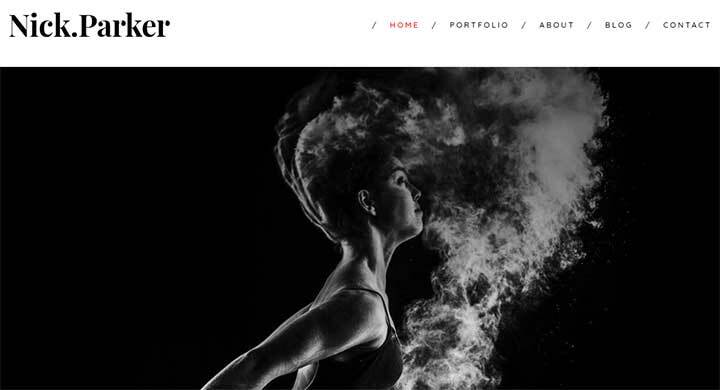 Nextop is a creative WordPress theme which is a one-stop solution for creating a model agency, single artist portfolio, Creative agency, photography website, Architects and more. This theme provides many stunning pre-built demos that you can import with just one click. Nextop gives you an option to choose between top and side positions for the website’s header. Each of these headers can be fully customized as well. You can also customize the title area by choosing its position and different types of animation. Other versatile features of this theme are compatibility with Visual Composer, 600+ Google Fonts included, SEO ready, Sticky Header, Adding Custom Styles and a lot more. Podium is an attractive Model Agency WordPress theme which can be used to create a modeling agency, model’s portfolio, modeling school, catalog website, and any type of fashion website. This stylish theme is equipped with many premium plugins such as WPBakery Page Builder, Revolution Slider, and Essential Grid Plugin. All these plugins are best to enhance the functionality of your website. This modelling portfolio template features some awesome easy to use options which can be used to customize the website easily. Other unique features of this theme Multiple Blog Styles, 20+ Post Animations, 750+ Customizer Options, Custom Widget Sets, and shortcodes, etc. Salient is another powerful and responsive multipurpose WordPress theme which allows top modelling agencies to create almost any type of website in just minutes. This theme comes with 250+ templates which you can choose from to create a fully-functional website. Salient also offers 525+ shortcodes and configuration options which give you unlimited possibilities customize your website. This model agency WP template comes with its tailored version of Visual Composer which allows you to build gorgeous pages with the simple drag and drop functionality. Some of the outstanding features of this theme include Exclusive Sliders, 4 Icon Packs, Masonry Image Galleries, Built-In Mega Menu, Multiple Blog Styles and more. A simple yet advanced Multipurpose WordPress theme, Jupiter gives an unparalleled user experience and allows best modelling agencies to create a website with so much of ease. With Visual Page Builder, you can create pages in real-time and how it looks. This theme also allows you to design your headers. It also comes with 160+ pre-built website templates which you can customize as per your needs. This theme also comes with 100+Elements, 490+ styles, 18 Pre-made header styles, Mega Menu Widgets and a lot more options to create a fantastic model agency WordPress website of your own. One of the most creative WordPress model agency theme for creating websites of any type, Oshine is loved by many. 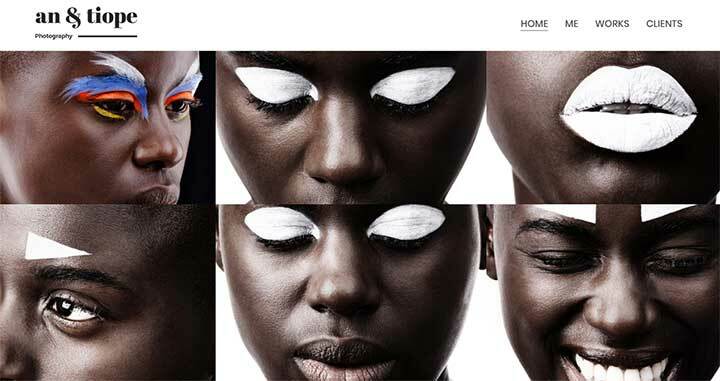 This model agency theme allows you to build beautiful websites for any purpose namely photography, agency, Business, Shop with ease. Oshine offers high-quality design, 45 demos with 100s of pre-built sample pages, 50+ styling modules, and a lot more. Oshine lets you build any type of model-agency related website. You can easily customize this theme and can create your unique designs with from scratch with the powerful Visual editor that comes with the theme package. You can pick this theme if you want to create a model agency website with a mixed touch. Stockholm is a simple and fully-responsive theme to help you create fully-equipped model portfolio websites for your agency. This theme offers 40+ ready to go stylish demos to showcase your work with sheer elegance and uniqueness. Stockholm is also compatible with the best WordPress plugins such as WooCommerce, WPML, Contact Form 7, Gravity Forms and more. 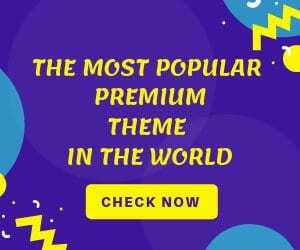 Other powerful features of this theme include a Flexible header, One-click demo import, 800+ Google Fonts, Customizable Mega Menu and a lot more. Casting is a talent management WordPress theme which comes with a unique feature such as front-end profile submission which allows the potential talent to submit their profiles from the front end. 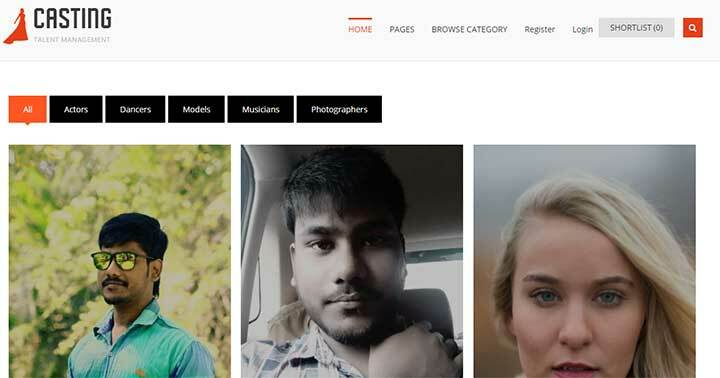 This model agency WordPress theme is a dedicated theme for creating websites such as Actor Management, Talent Acquisition, Model Castings, Talent Agency and other types of websites as well. This theme is compatible with PODS which can help you create custom meta fields like Text fields, Select Boxes, Check Boxes, Radio Buttons, Sliders, uploads and more. Casting is a responsive theme with drag and drop builder which you can easily use to create your pages. Last in our list but not the least, Brook is a highly flexible WordPress theme which highlights the creativity aspect while building a website. This WordPress model agency theme comes with more than 30 customizable homepages, 20+ blogs, and portfolio layouts, 12+ header styles, 16+ footer styles which you can easily customize to create the perfect model agency website. It is a highly versatile theme which gives modelling companies an elements for designing almost anything. Accordions, alert messages, Buttons, Carousels, Counters, Google Maps, Lists, Testimonials are some of the shortcodes offered by this theme. Brook is also compatible with the famous WooCommerce Plugin so that you can easily convert your website to an online store. So, if you want a clean, multipurpose, responsive theme, then Brook is the best choice for you. 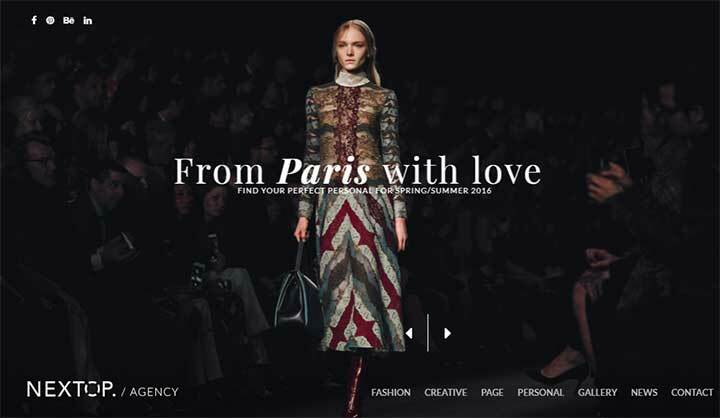 If you are looking for a lightweight model agency template which retains users on your model portfolio website, then Parallax can be a great option for you. This theme allows you to tell a story to your visitors by keeping the page content in proper narrative order. Keeping the readability and visibility quotient in mind, this theme divides the content into parts thus giving your readers a distraction-free reading. Parallax allows you to build up your site with five homepage customizable widget areas. You can also customize the header and other theme settings, color scheme, and content. A mobile responsive theme, this theme is also an eCommerce theme which integrates well with WooCommerce. A responsive model agency theme, Faxhion is best suited for creating an elegant fashion website. Moreover, it is also a multipurpose theme which can be used to create any type of websites such as Creative Agencies, Photographers, Designers, Artists, Personal Bloggers and more. Faxhion is powered with Visual Composer and Master Slider WP Pro; you can easily create a stunning model agency website in no time. It provides you nine ready to use demos, four different portfolio list style, three different header styles, and 6 Posts variants to get you started quickly. Other features of this theme include Easy customization, One-page navigation, Browser compatibility, Clean design, one-page navigation and a lot more. Exposure is a beautiful photography theme by Themefuse. This model agency WordPress theme comes with many options for photographers and allows them to customize almost everything. It is easy to use a theme which gives options such as Multiple Slider Options, changing the highlight colors with a single click, built in page layouts, Google Font Integration, and mega menu option. Exposure is a responsive retina ready theme which is best suited to enhance your creativity and reach the sky. Another photography theme by themefuse, a shutter is easy to use a theme for fashion model agency, photographers, designers, photobloggers and photo studios. It gives you five elegant demos which allows you to present your project in a professional yet subtle manner. Shutter is a fully responsive WordPress theme, which gives you tons of features such as colors, typography, fonts, and sizes to customize your site. Shutter also allows you to translate your site in any language with the incredible WPML plugin. Also, this theme is SEO friendly and comes with lots of menus, sliders, and buttons to transform your site in the way you want. Styler is a theme specially developed for Beauty, Health and fashion business. This WP model theme comes with simple yet powerful homepage templates which can help you create a stunning website. Styler comes with five custom post types such as Galleries, Manage Services, Testimonials, Price List and team. This theme also provides a versatile widget for displaying any kind of content. Model agency websites can also choose between image, video or slideshow sections or select your layout, as per your needs. A fully SEO optimized theme, Styler lets you built a and designed an elegant site of your own. Salon is another model agency theme built by the CSS Igniter folks. This model agency WordPress theme is best suited if you want to build a Wellness WordPress website or a Beauty salon and spa website. This theme gives you a drag and drop modular homepage which can create a unique first impression for your users. You can also create your content in a creative manner with the help of columns, masonry layouts, filters and a lot more. Salon also gives you unlimited color schemes which you can choose from. You can also sell your services easily as this theme is fully compatible with the famous WooCommerce plugin. 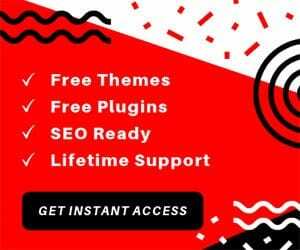 Other features of this theme include Regular Updates, One Click Demo Import, Speed Optimization, SEO Ready, and Compatibility With Popular Plugins. 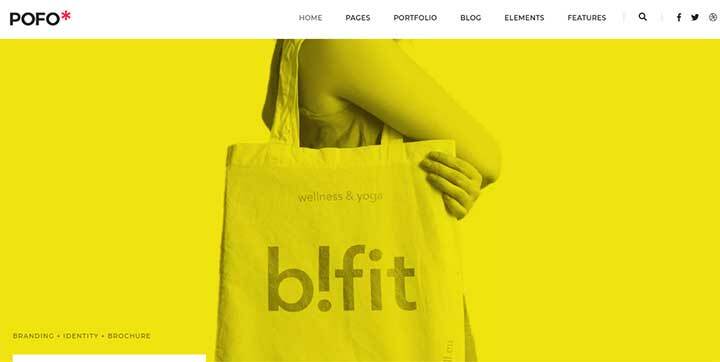 This WordPress model agency theme allows you to convert your retail business into an attractive and fully-functional e-commerce online website. 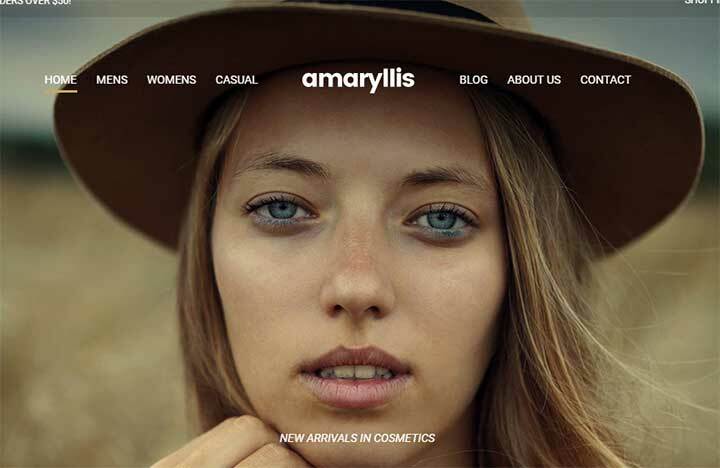 Amaryllis brings to you an out of the box design which can promote your business and reach new heights. You can build your site’s homepage the way you want with the Drag and Drop Homepage with zero coding skills. This theme also brings custom widgets to add more functionality to your site. Other amazing features of this theme include support of the powerful Jetpack plugin, SEO Optimized theme, Premium Support and many more. Any Other Model Agency WordPress Theme? All the themes mentioned above will give you the simplicity and elegance that is needed to create an ultimate fashion website for best modelling agencies. So, now you can easily choose a theme that best suits your needs and creates a stunning model agency website with WordPress. We hope you liked this article. Please let us know your valuable suggestions in the comment section below!